Sorry for the late post, but here it is, finally! 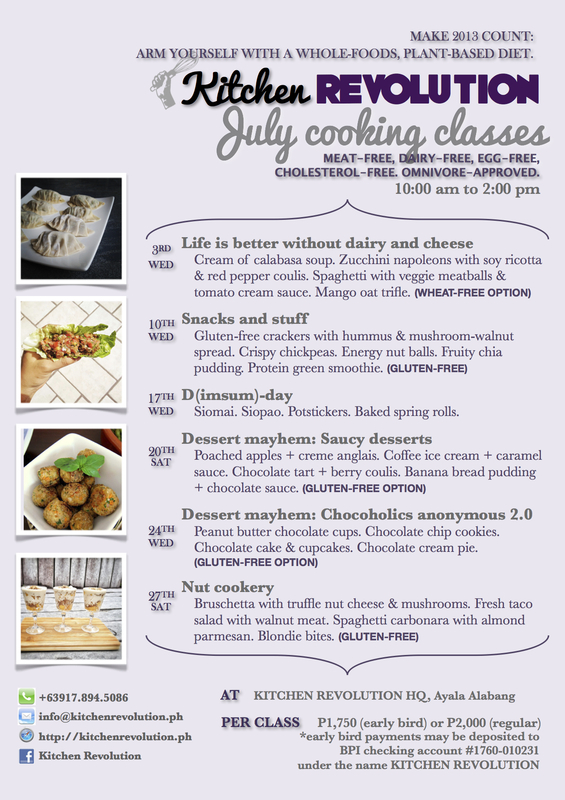 Get cookin’ this July with our roster of flavor-packed, nutrient-dense cooking classes! Explore the world of plant-based alternatives to dairy and cheese in LIFE IS BETTER WITHOUT DAIRY AND CHEESE (3rd, Wednesday). Learn how to prepare quick and easy superfood merienda in SNACKS AND STUFF (10th, Wednesday). Desserts get spectacularly sauced in DESSERT MAYHEM: SAUCY DESSERTS (20th, Saturday). This class is gluten-free friendly, folks! We cover all things chocolate and lovely in DESSERT MAYHEM: CHOCOHOLICS ANONYMOUS 2.0. This class is gluten-free friendly, folks! (24th, Wednesday).